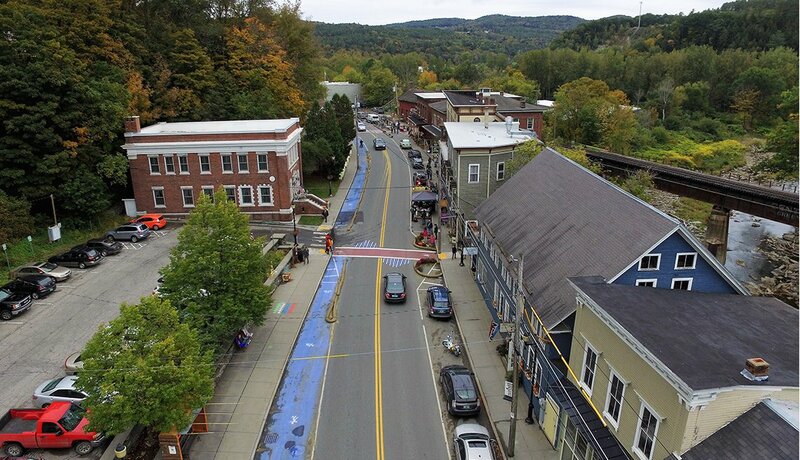 See how a weekend transformation made downtown Bethel, Vermont, pop! 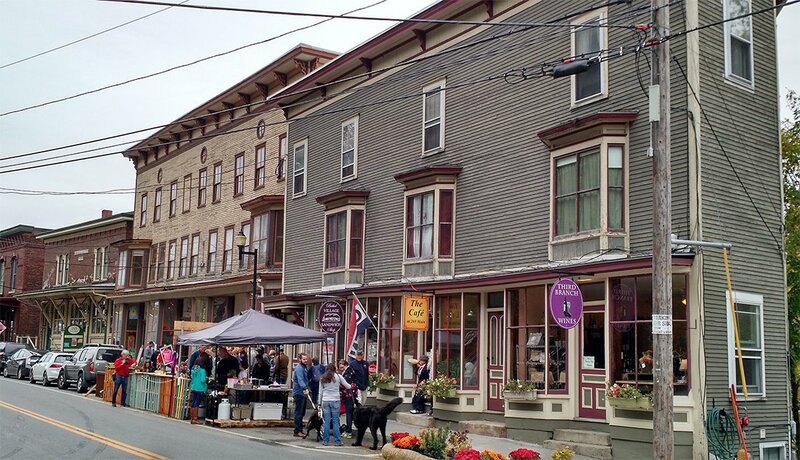 In 2016, the planning group Team Better Block partnered with AARP Vermont in the town of Bethel (pop: 2,030) to demonstrate how placemaking and community design influence successful aging, health, economic vitality and overall livability. 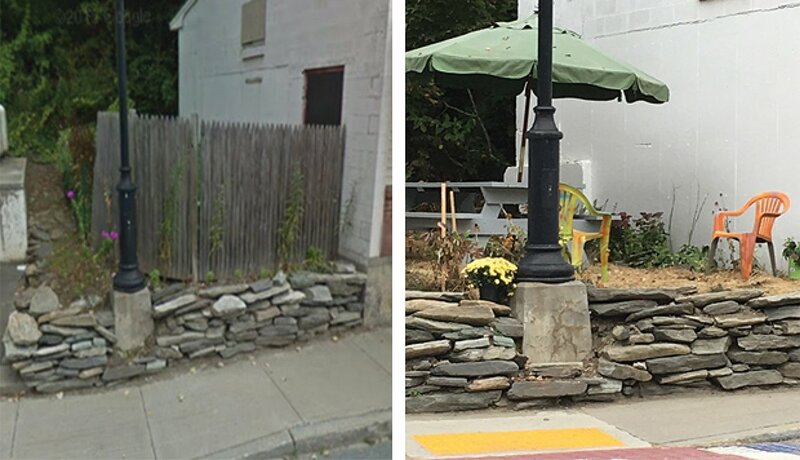 The event took place over a weekend in early October and featured temporary "pop-up" businesses, street modifications, new public spaces and many other small interventions aimed at improving livability in the downtown corridor. 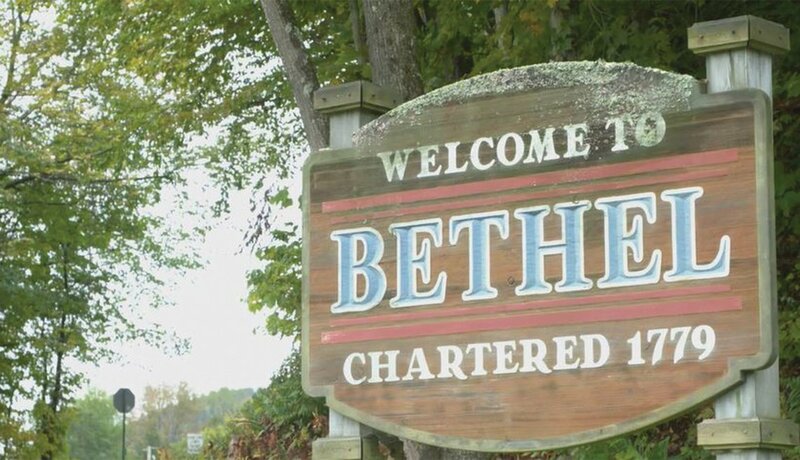 Bethel was a great place for a Better Block demonstration project because it featured a good street (suitably named Main Street) that could be made better. 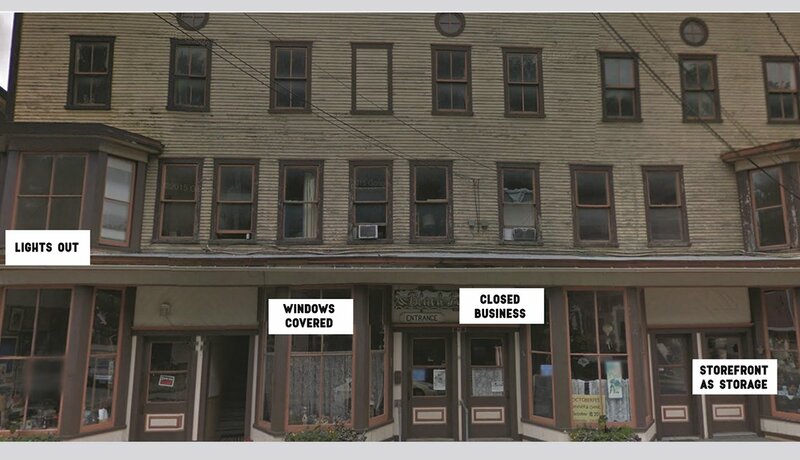 Among the reasons Bethel benefited from a Better Block intervention was that many of its downtown buildings, including this historic one at 257 Main Street, were vacant and in need of a facelift. 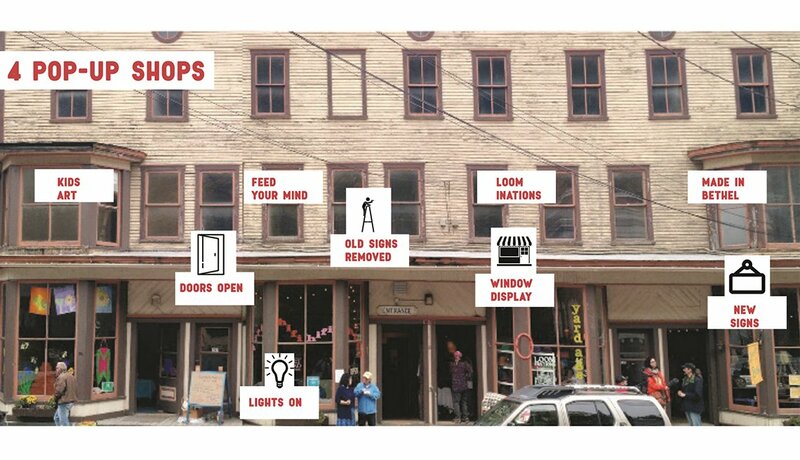 During the Bethel Better Block weekend, pop-up shops and services took upoccupency in the building's street-level spaces. 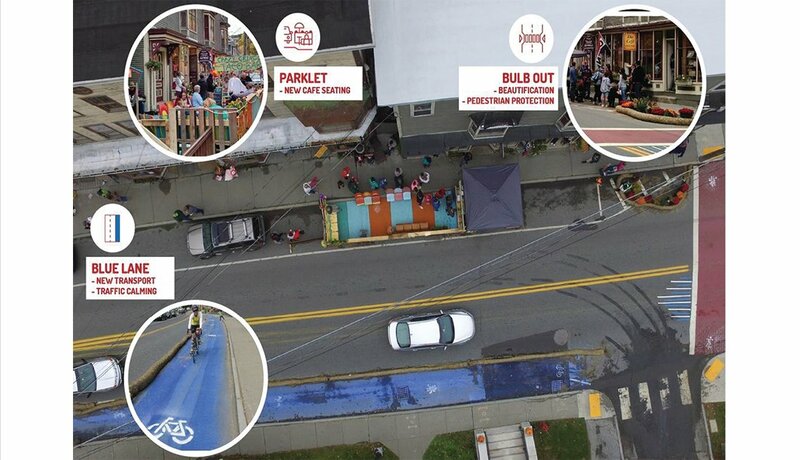 This bird's eye view image shows three demonstration projects that were added to improve Main Street's walkability. 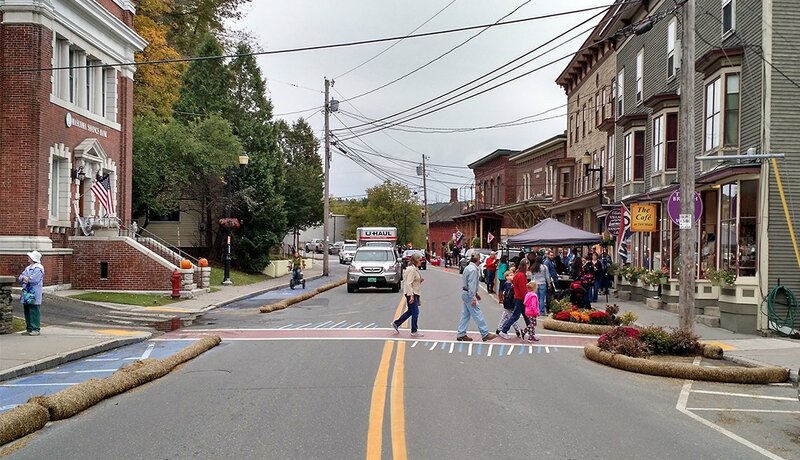 Stripes added to the crosswalks and curb extensions enhanced by landscaping bulb-outs helped alert drivers to the presence of pedestrians and reduced the crossing distance from one side of the street to the other. Two parking spots were taken over for the weekend and transformed into spaces where people (rather than cars) could spend the day. 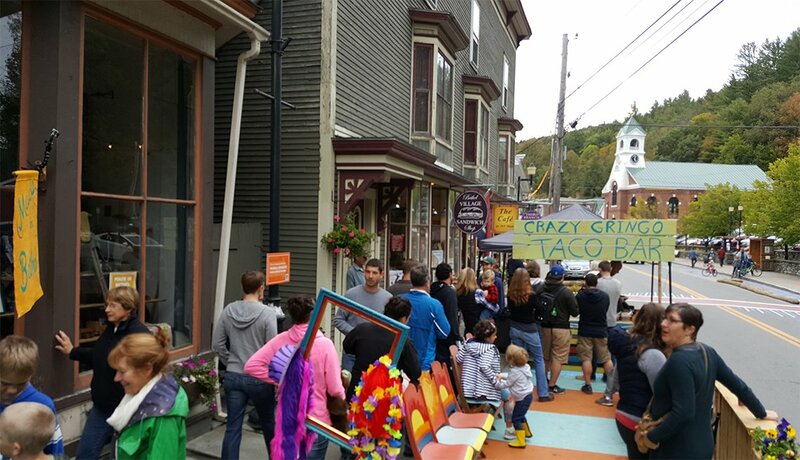 The floorspace within the two parking spots provided room enough for both a pop-up taco stand and a dining area. 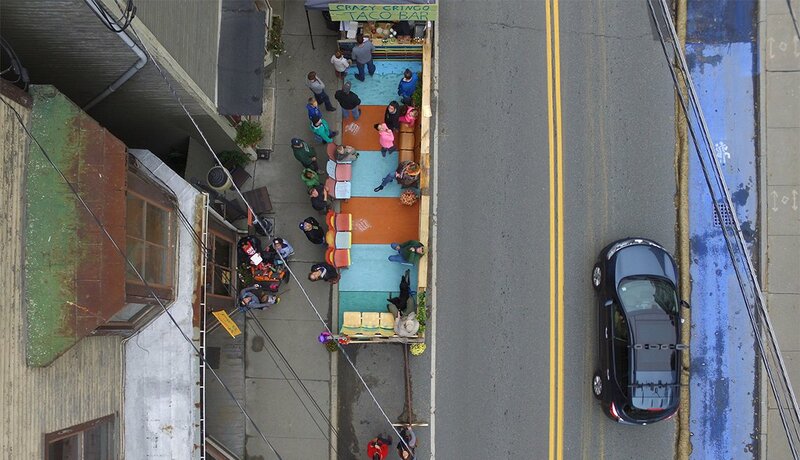 Sidewalk seating and dining brings activity and activities to Main Street. The food stand generated $900 in revenue during the three-day event. 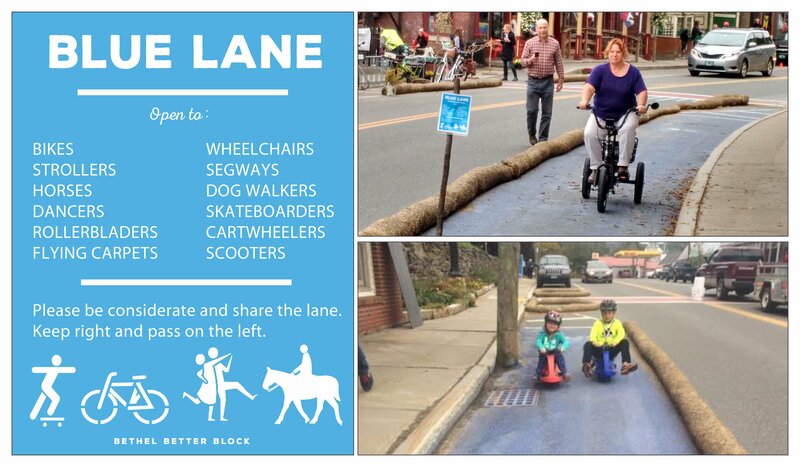 The most noticable change to Main Street was the addition of a dedicated, 700-foot-long walk-bike lane. (The lane borders were created by using straw wattles.) The Blue Lane concept originated in Denmark. 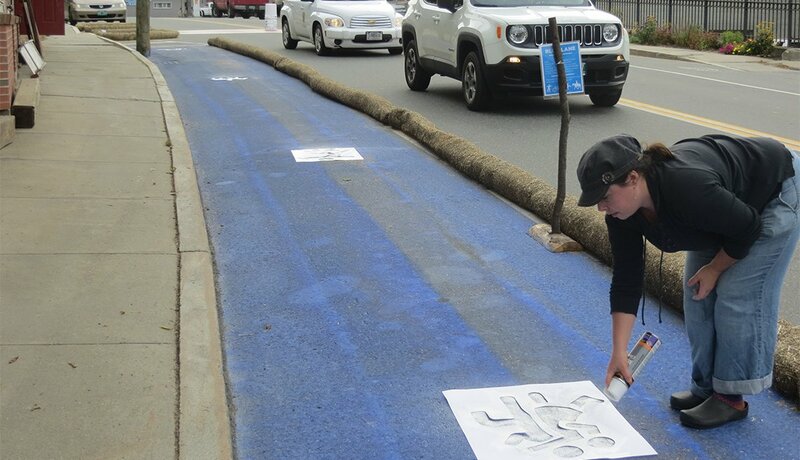 Bethel was its first use in the U.S.
A volunteer is shown spray painting an image of dancers, which was one of the several icons used to indicate that the Blue Lane welcomed all kinds of non-motorized means of getting around. 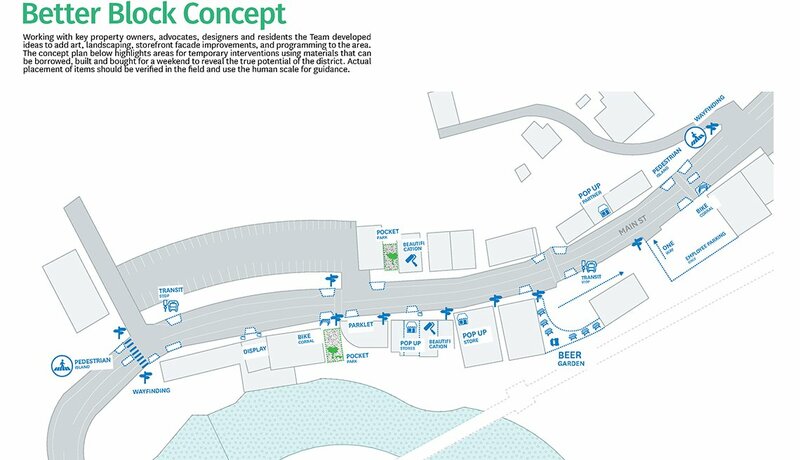 Small, seemingly discarded spots of greenery can be opened, tidied and shared as outdoor public spaces. 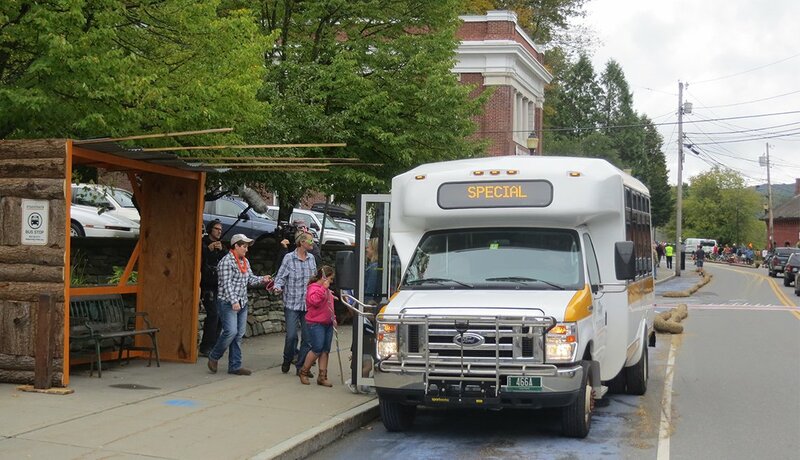 After the weekend event, the private transit operator that was used to get visitors in and out of the downtown decided to add a permenant route through Bethel. When the weather is nice, it's nice to have a place for sitting outside. 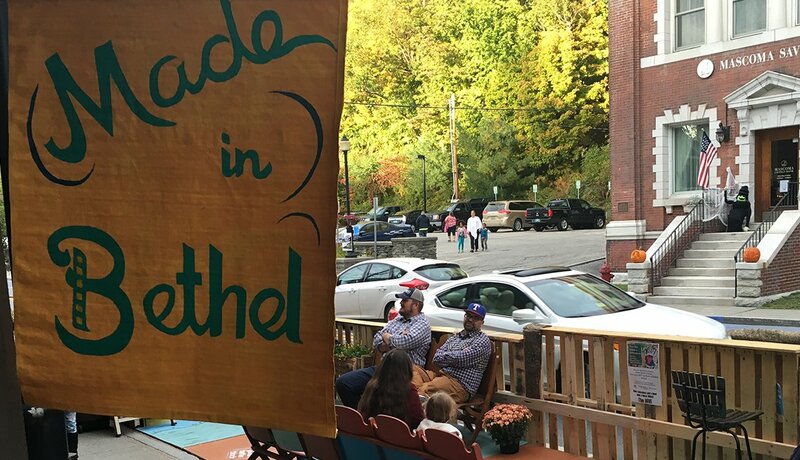 See more scenes from the Bethel Better Block weekend and learn about the damage caused to the town when Tropical Storm Irene swept through in 2011. Watch the video or read more about how the demonstration came to be. Stay Informed: Subscribe to the free, AARP Livable Communities e-Newsletter!